Research suggests that a significant number of cars in busy parts of the city are searching for parking -- a base of 8% and as much as 30%. Everybody craves free parking, but people even drive around a fair bit to find metered parking. Street parking is convenient, and many parking lots charge a lot for the fist two hours, or a flat fee, making them expensive choices for certain parking stays. Hunting for parking has an immense cost in congestion, wasted fuel, and wasted time. I think we can do it better, and even before we have robocars. We're approaching the era where almost every car on the streets is equipped with a smartphone. That opens a lot of opportunities. It's not at 100%, so solutions can't be 100% phone based, but new options are available. Note this proposal would be done through the city government, though most of the actual logistic work would probably be done through private companies providing apps, maps and photos. The first thing we probably want to do is get rid of free parking. As Donald Shoup argues in The high cost of free parking there is no such thing as free parking, and we all pay for it in other ways. I don't support all of Shoup's conclusions but one way we pay is it creates parking shortages, a tragedy of the commons, as people don't value what they don't pay for. Let's imagine a system for managing city owned parking (streets and lots) presuming most people have a smartphone. There would be no more parking meters. Spots in managed areas would be marked and numbered (with some areas where there are markers every foot.) When you head to a destination wishing to park, you would enter that destination on your phone in the usual way. In a managed parking zone, all spots are marked no parking unless you have the slot booked through the parking system. You may not just pull over into a spot you see, except for a minute to use a kiosk. You provide a destination to a navigation app or the nav in your car. Like you always do, but you indicate whether you need parking near it or not. Upon approach to the area, your phone/car announces, "I have parking at $1/hour 500 feet from your destination. Also $2/hour 100 feet away, and $4/hour with security 1000 feet away." You tell it which one you like. Knowing your preferences, it may have pre-selected. If so steps 2-3 are skipped. Your phone or car now gives you directions to the spot. "It's spot 34 on Maple St. between 3rd and 4th." There would probably also be a photo of the spot to make it very clear where to park, particularly if numbers are not present or hard to read. It might, while guiding you there, say, "A better spot just opened up 100 ft. away. Taking you there." If, when you arrive, somebody is in the spot, you say so and another spot is quickly allocated. The location is flagged for enforcement to come ticket that car. You may photograph the offender but we don't trust you that much. Your phone or car notices when you leave and pays your bill, marking the spot free. Your phone would know your car model, and its dimensions. You would be assigned a spot you can fit in. Smaller cars (like a SMART or a motorcycle) could get shorter spots and pay less for taking less space. See below for more. The fee for formerly free spots would be quite small -- perhaps 25 cents/hour. Not the sort of price anybody would notice, just enough to make sure the space is allocated in an orderly way, and nobody drives around hunting for parking. Your price might vary based on how long you are staying. And local merchants might scan the code on your phone to pay for your parking if they wish to. Or, reversing that, Shoup suggests that a large fraction of parking revenue from formerly free parking spots be given to the local districts for improvement, which works well and makes the locals fans of the parking fees. Private spaces could also offer themselves, and the city might happily direct you to spaces in private lots, even open driveways, and transfer the money. A new generation of garage door openers could be set to open for customers reserving this way. You could program your phone with your preferences for price vs. distance from your destination vs. security of the spot. The enforcement cart would know what spaces should be occupied by what car. They don't need to read the licence plate, the length and type of the car would be enough for it to know if a car is somewhere it should not be as the enforcement cart (or robot or drone) drives down the road. They would also know about reports from people who parked in somebody else's spot. If what I propose here seems a bit too complex, understand it is only suggested for when and where it's needed, where parking is in short supply and/or badly used. Shoup estimates that 99% of parking in the USA is free, and most of it doesn't need management. Only a small fraction of street parking spaces are even metered. Road signs could indicate when parking is managed and when it is not. Your phone would know what kind of car you have and thus its dimensions. As such the system can assign things more efficiently. At the most basic level it can assure the space is big enough for your vehicle. At a higher level, it could start allocating longer, unmarked regions efficiently. For example, if there is a 26' long section, that can't fit two regular cars but it might fit one regular car and one city car. It will know where motorcycles can go, too. To get very fancy, the gaps and spaces might be marked with numbered stripes on the curb every foot. You could be told to park your 15 foot car between strip 12 and 27. The system would leave space between you and the next car to be sure you can get in and out. In parking lots, the stripes could be there to mark width. SUVs would get wider spaces and pay for it, but space would be optimally packed. We could also know about special needs, like the desire for electric car charging, if some spaces have that. As noted, the city should allow private spaces to rent themselves through the system. Surplus space in business parking lots after hours. Regular commercial lots. Private spaces in people's driveways, or even in front of them (blocking the driveway) on the street. In the latter case, you would need a system to deal with people who are late to pick up their car, or with emergencies. Some modern cars have electronic locks which you could give temporary permission on for emergencies, or people could just pledge to come out of their location to fix (rare) problems for a discount. The supply of private parking is often large and unexploited. Not everybody has a phone, and phones sometimes break. Fortunately, since people will keep a charger in their car, loss of battery should rarely be a problem. For those who do not own a phone, the city can easily provide one for free or super cheap by buying up used older generation phones -- these are plentiful and cheap. It would make a deal with wireless operators to provide data plans which can only be used for the parking system. (As well as other city systems, like transit tickets or traffic management.) While the system should be lucrative enough to pay for the cheap phones and the data usage, the "free" phones could also be sold as "$30, including $30 of parking credit" in a similar fashion to toll transponders. For those without any device, or whose phone has broken, convenience stores could offer a kiosk where you can go it and request parking in the area for your car. You would pay in cash at the convenience store if desired -- you might need to predict how much parking you want to buy, just like you have to do today at most meters. You could also have an account without having a phone, and you could top up the account at the convenience store or buy prepaid parking cards if you have a phone and no credit cards. 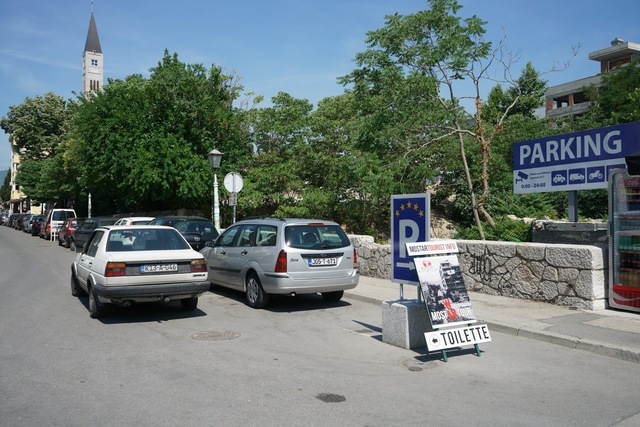 There could also be kiosks on the street where you could also request a parking reservation and space for your car. Many cities recently have stopped using per spot meters, and have kiosks that let you buy street parking by giving you a paper receipt to put on the dash. These machines could be repurposed for the new system. All you need is an old cell phone, a protective case, and a solar panel to keep it charged. This is a little less convenient than just pulling into a spot you see, but that's why the recycled phones will be cheap or free. The with-phone experience, with no hunting and an assured spot, is a lot better experience in any area with parking shortages. For areas that have no shortage, the old system of open free parking can be used. And it can be open free parking at certain hours of the day, as well. Residents would not need special permits. They could be offered special prices. They could even be offered quasi-ownership of the space in front of their house, in that the system might not allocate it to anybody else until the street is full. Of course, that presumes we want to subsidize residents' street parking -- we may or may not want to. We could also allow residents to reserve "their" spot in advance of arriving in the neighbourhood, to give them the best shot at a spot near their house. We can arrange for better parking for people with disabilities. For example, there are different disabilities. People with wheelchairs need to park next to a wide area to get the chair out, but they often don't need to be the closest spot to the door. People with trouble walking don't need a wide space but need a short walk. The space allocated can be customized to the person. This doesn't solve the issue that special spaces (the wide ones for wheelchairs) need to be kept in reserve. One idea is to let the disabled reserve their space much further in advance. This still allows some dynamic allocation. You could also let regular parkers use some spaces under the provision that they agree to come out and move their car in the rare event a disabled person needs it. The system should erase all data after a parking session is complete. It need not even know who you are or the plate on your car -- the model and colour are sufficient to spot people in the wrong place, the odds of coincidence are small. People should be able to buy parking credits for the app on prepaid cards with cash if they wish, preserving their privacy. You can keep receipts in your own phone if you like for a few weeks, to challenge any parking ticket applied by accident. I should also note there is an opportunity for something a little creepy here, namely private enforcement of improper parking. While it should be profitable for the city to dispatch a parking enforcement office to a spot occupied without paying, you could also let neighbours do this. The pre-approved and bonded people living near the spot would get a signal about an illegal car, and walk out to photograph it with licence plate and location clearly visible. They could get paid a portion of the parking ticket. You might find people on bikes or the homeless getting into it, though in reality if enforcement got that swift, illegal parking would plummet and it wouldn't be a great gig job. Naturally robocars would participate in this system, and like the simplicity of just going to their allocated space. They could do far more, since they are able to move any time if requested. This would allow the parking management system to re-position robocars to clear gaps between cars and more efficiently allocate the total space. Parking could be rented by the minute if desired. Clear spaces could be allocated to taxi vehicles needing to do pick-up and drop-off. Robocars would obey, though Uber drivers might still grab whatever space then can, since it's hard to enforce when they only pull over for a moment. Still, it makes sense to leave spaces open in areas that are getting lots of pick-up/drop-off requests, and the taxi companies could actually communicate that demand to the city to make sure that spaces are kept open at the times they are needed.